Take care of your incredible feet! 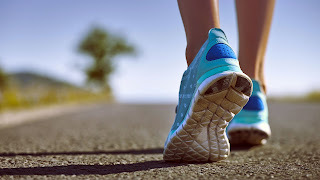 Your everyday shoe choices are important however in this blog we'll focus specifically on training footwear and sports injury prevention. High impact physical exercise, such as running and skipping transfers a lot of force through your body. If your feet and the surface you are on don’t absorb much of this shock then the energy has to go somewhere, so the majority will pass up through your body to the hips, the knees, lower back and so on. As we mainly walk on man-made rather than natural surfaces with little to no absorption (such as asphalt) we can rarely depend on the ground absorbing any of that shock. So for specific running trainers I recommend going to a good running shop and selecting a trainer suitable to your foot shape. Many good running shops now provide a gait assessment in various trainers, which can help you select the correct trainer to support your unique foot. Each trainer brand varies and you may find one is more suitable for a wider foot and a different one for a narrower foot. It is wise to consider support in other areas of the foot too, particularly if you have a history of foot pain. Your chiropractor may check your feet to asses for any restriction and treat these accordingly to improve your function. Poor foot mechanics can often lead to issues at the knee, hip, lower back or elsewhere in the body, therefore it’s very important to get the foundation right and not to neglect your all important feet. It's important also to make sure your trainers aren’t too small as this can lead to extra stress on toe nails and other areas of the foot, which can lead to blisters and foot pain, preventing you training and leaving you seeking sports injury treatment. It sounds simple but is often overlooked, that once you've selected the correct trainer, you must wear them correctly. Tying up your shoes fully and using all the eyes, to provide an equal support can help prevent sports injuries. Don't be lazy and force your foot into any shoes without untying them. More on Karen and booking in at the Octagon clinic here.